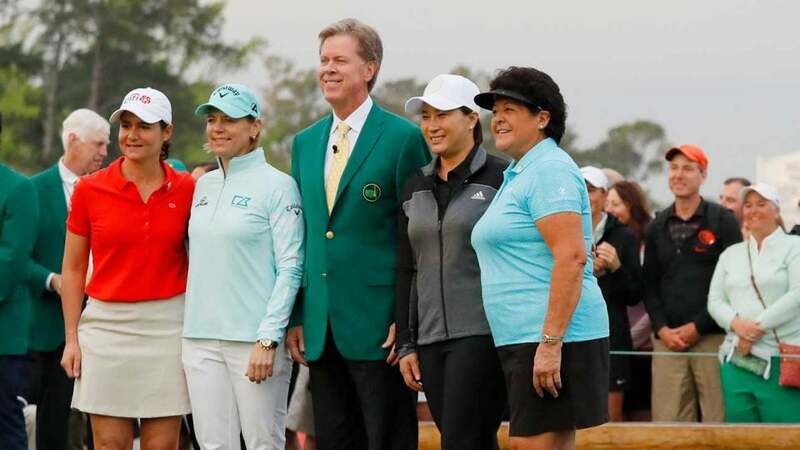 Fred Ridley, center, poses for a photo with four legends of women's golf. AUGUSTA, Ga. — Augusta National chairman Fred Ridley’s annual press conference sailed along smoothly Wednesday morning. Unrevealing answers flowed, one after the next. And then, with the last question, he was pressed for a third time about the idea of Augusta National playing host to a women’s professional event. With more than a dozen green jackets peering at him from the back of the room, Ridley paused for a few beats to gather his thoughts. “We’re really looking to the future,” he said. “We also have to be respectful of the Masters Tournament. “We were trying to balance providing the women competitors with the opportunity to be at Augusta National, to have a championship decided at Augusta National, but yet be cognizant of the fact that we were just a few days away from the Masters Tournament. Translation: No, there will not be a women’s Masters equivalent held at Augusta National. Not anytime soon. Perhaps never. Don’t let the electric start to the Augusta National Women’s Amateur get your hopes up. Fred Ridley walks alongside the winner of the Augusta National Women's Amateur, Jennifer Kupcho. Ridley is, to a degree, a victim of his own success. His first major decision as chairman was setting the stage for 72 of the best amateur female golfers to show off their talents at Augusta National. Ten years ago, when the club had not yet admitted a female member, the notion of such a tournament on these grounds was unimaginable. So hopes are high among a large section of the golfing population that Ridley will find other ways for the club to use its powers to improve the game. He admitted Wednesday he’s still “glowing” about the women’s event, and he believes it to be the greatest benefit ANGC can push forward, outside of the Masters, in an effort to grow the game. Unfortunately for him, as the leading light of one of the governing bodies of golf, successes don’t end the questions. On Monday morning, LPGA pro Alison Lee, posted on Twitters: “Sooooo when do we get to play Augusta?” It isn’t Ridley’s job to elevate women’s golf, but he does have the platform to do so. And so, the questions persist. When the topic circled back, Ridley bobbed and weaved like a prizefighter. The club’s history is rooted in amateur golf, he pointed out, beginning with one of its founders, Bobby Jones. Ridley added that the women’s amateur event puts its contestants on a tremendous stage, and that fanfare will follow them to the professional ranks. But as for a professional event with the same effects? Sorry, ain’t happening. Everything about the Masters is getting bigger. Everything about Augusta National’s imprint on the game is expanding. But for now, at least, those plans don’t include the women’s professional game.